One of the most powerful American prelate for over a quarter of a century, and a rising star of the East Coast for another 25 years prior to that, Cardinal Mc Carrick is a perfect poster boy for all what is wrong in how the American Catholic Church has been run and administered for half a century. At the same time that every Catholic observer and pundit has graced us with their analysis, some pertinent, others not that much; most have overlooked something, we on Guam have become more sensitive to. I shall try to analyse this today. 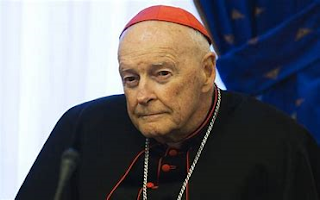 Almost all Catholic websites around the world, as well as many non religious news groups have covered the fall from Grace of probably the most powerful American prelate of the last half of the last century. A man with access to the White House, the corridors of power in Washington DC, as well as a member of the College of Cardinals with unfettered access to the same corridors and offices of the Vatican. Cardinal Mc Carrick was the poster boy of the Vatican deep state. As far as anything of importance happening within the Church, inside the USA Catholic conference of Bishops over the last 30 years, Mc Carrick had his fingers in the cookie jar. He was involved either directly or indirectly with every single dossier put forth in the USCCB. This in itself is monumental. Specially in view of the impact it has on all of us, in our daily lives. Many articles have pointed to these facts. Yet at the same time, some are already very active, trying to capitalize, on the issue, while putting the Pope on the defensive. The most notable being Cardinal O'Malley of Boston, who had already publicly attacked the Pope during the Chilean sexual abuse there. In order to do so, he uses the oldest Catholic Newspaper in the US, and its well designed blog: The Pilot, where he is pushing his new found agenda. In doing so, he is manipulating some of the Main Stream Media, who are always eager to embarrass the Church. In this case, they do not see the subtility of O'Malley using them to his advantage. Suffice to say, that the main Catholic news services will surely pick up on these issues, and become the relays of O'Malley very astute move. During that time the main Catholic websites are trying to either, explain, in some cases justify, the silence of the Bishops, while others on the conservative side are going for the tried and true Gay Mafia angle. The blogs: One Peter Five, and the Remnant, who are usually very informative on many issues, have gone full speed ahead with this. Others are more middle of the road, while remaining quite conservative. The more main stream Catholic medias, like the Catholic News Services, Crux or Aletia, have tried, all in their own way, to strike a balance between apology and embarrassment for yet another scandal; while trying to explain and justify, the inexcusable. I guess they are continuing their guilty approach, without really reassuring the faithful. As you can see, this continuing scandal is not letting anyone indifferent. So! What is really going on behind this new found morality of Cardinal O'Malley? Perhaps a visit of the main media service of his most devoted backers the Neocatecumenal Way could give us a glimpse about what is going on. 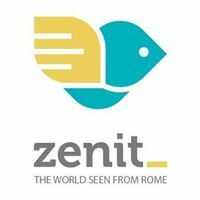 Zenit the mouth piece of Kiko Arguello and his agents, posing as an insider from Rome, gives us a very good idea, where this is going. THIS IS EXACTLY THE SAME MESSAGE. 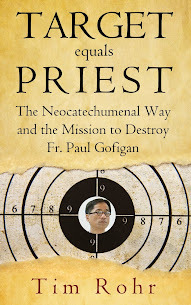 Why would the Neocatecumenal Way push what appears a well thought of agenda, against sexual abusers, while they are aiding and abetting sexual abusers in their midst, as they did Apuron and Mc Carrick himself? We have demonstrated on many occasions the close relationship between O'Malley and Kiko Arguello, as well as between O'Malley and Gennarini (Kiko's agent in the USA). They are so close, that O'Malley even accepted to sit on the Board of directors of Kiko's premium project in Israel: Domus Galilaea. 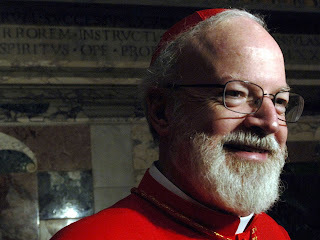 What ever Cardinal Sean O'Malley does, it is never done in a vacuum. Every time the Neos back him up 150%. So here we have Cardinal Sean attacking his former buddy Mc Carrick, and warning other accusations might be on the Way..... (excuse the pun) He did do something similar in 2014 with Bishop Finn of Kansas City. Clearly the Neos are polishing Cardinal O'Malley's image. This is a genial move. B) it pushes forward another papabili, that is in their pocket. Rome is certainly full of rumors, it is part of its DNA. But it seems more and more likely that Pope Francis's health might be declining fast. The Neos are pushing their pawns forward. You have to give it to them, they are very politically astute. 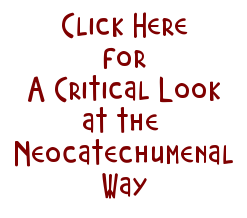 In the meantime the different factions of the American Catholic Church are at each other throats, and not paying attention to the Neos. The conservatives are pushing their anti-gay agenda, with some good justification. 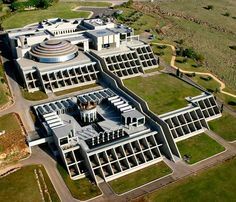 The modernists are trying to save some of their own, who have covered up their brethren, while keeping themselves relevant under these earth shattering accusations. LMAO! It has been a while since we have seen one of these here. Perhaps because it appears that the communities have been instructed not to engage us on this site....oops, someone is in trouble?? The Way claims it is spreading the word of God, while in fact, they are spreading the heretical teachings of a converted (or not) Spanish Jew. That is a huge difference. I see the truth every time, I participate to the adoration of the Eucharist. I do not need you to tell me what the truth is, according to Kiko. I do not hate you or any other Neos, I just hate the Sin. If you really were a free thinker, you would try to see behind the curtain your leaders tell you to stare at. Hi there 12.43. You are spreading the word of a god, but which god? And also, you are doing more at the same time, you (who don't have genuine training) are telling people they have intellectual pride in front of their peers, when they have been made psychologically vulnerable, you air in front of peers a person's occupational disciplinary history, you are keeping them subordinate (subalterns), you are sapping their initiative, and in the eyes of several denominations misrepresenting the True God and the true meaning of Holy Scriptures (under cover of many others who do likewise). You count on most of your readers by chance not having been eyewitnesses. And, worse than Kiko's teachings are those of the Red Brigades and their tentacles in commerce and administration. The intensity of the combination makes the poison fatal. We were induced into swearing oaths every three weeks, eventually. I always wondered how Giusseppe was able to emigrate to New Jersey, and live there (knowing his past), until a good friend of mine who worked at one of the federal agencies, reminded me that the red brigades in the 70s and 80s were manipulated by some agency usually linked to what is called now the deep state. The thing that really concerns me is the way purported Catholics treat their fellows. Bad boundaries and bad dynamics. Both in the world's eyes and in the eyes of Catholic leaders of true good will, that is the only thing that will show up in their true light any workers of wrongs (and it doesn't have to be brand-named NCW). Outside Guam and some extra good folks like Abp Schneider, points of doctrine don't have strong appeal. And yet, the standard of practice reflects actual (as opposed to claimed) doctrine. Pincer movements are a favourite ploy. It's good if we continue to distinguish junior "community" members from any prime movers with their protectors. When addressing the former, eyewitness accounts of long term members have more value than generalising adjectives like "deluded". Of course it's worrying what went on in regard to property registration in your territory. The threats we are talking about here have always existed inside the Church and are no different from usual. In my late Dad's day it merely had a different brand-name (it would shock you)! But it all goes back hundreds of years before him! It's so simple - bad boundaries and bad dynamics. That's what the teaching of Jesus and the Apostles is about. In regard to forgiveness we don't even know what has been done TO us! Something to do with trifling with our very credence probably. And always an above average concentration of apparently good church authorities to launch it. Can we see prayer threads and/or prayers added to these threads. I am this minute saying three Glory Be's for God's little ones! True religion doesn't have harmful intensity. his fallen brethren to repent and reform themselves, not that they might thereby remain in their positions but to save their souls. At the conclusion he felt compelled to justify the entire enterprise, which some might regard as meddling on his part, asking how he could possibly have remained silent "when the divine voice issues a terrible threat through the mouth of the prophet and says, 'If you see your brother doing evil and you do not correct him I will require his blood from your hand'" (p.87; cp. Ezek. 3.18, 20).